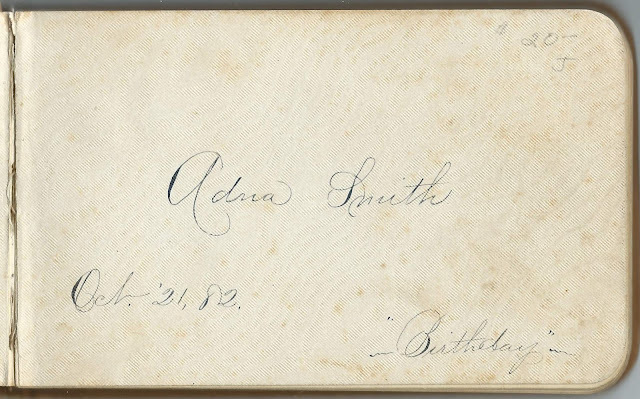 1882-1890 autograph album of Adna Ames Smith of Vinalhaven, Maine, received as a birthday present on October 21, 1882. 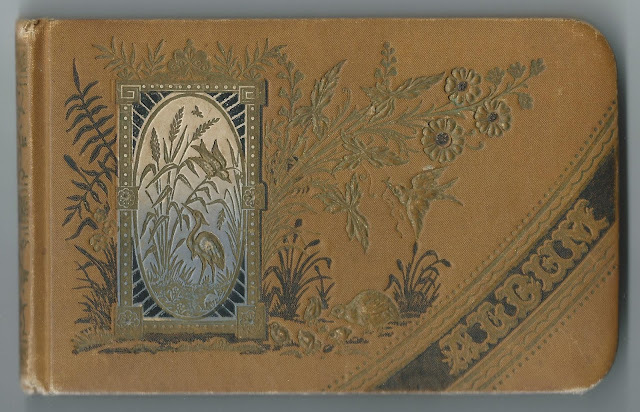 The album measures approximately 6-1/4" by 3-3/4" and contains the sentiments of 63 of Adna's relatives, friends, schoolmates and teacher. An alphabetical surname list appears below and an alphabetical list of the inscribers, together with any personal information they offered, appears at the end of this post. Adna Ames Smith was born about 1871, perhaps on either of the islands of North Haven, Maine, or Vinalhaven, Maine, the daughter of Charles B. Smith (1845-1913) and Eliza Jane (Dyer) Smith (1852-unk). 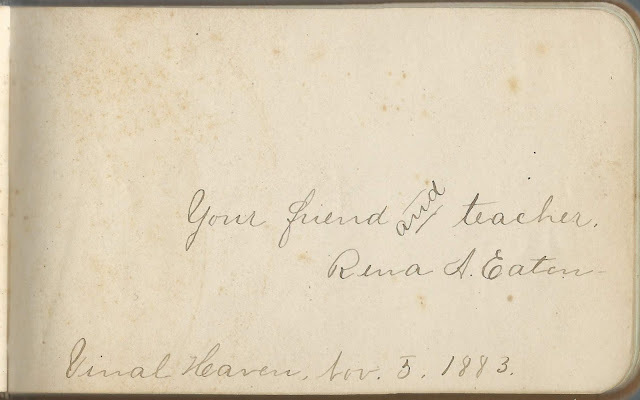 Each of Adna's parents inscribed a page in the album, as did her sister Lillian L. Smith and brother Leslie Francis Smith and several other relatives. It's possible that the Jane C. Smith who inscribed a page in 1885 at Vinalhaven was Adna's paternal grandmother Jane Calderwood (Carver) Smith (1822-1896). Refer to the List of Inscribers, below, for the names of other relatives who inscribed pages. I've stated the relationship where mentioned and teased out other some relationships, but if you know of more, please leave a comment so I can amend the information. On September 24, 1910 at Vinalhaven, Maine, Adna married Charles Hanley Thomas, son of David Thomas and Aldanah Crocker (Dyer) Thomas. I didn't find children for Adna and Charles, nor a death year for Adna, whose husband Charles indicated on the 1940 U.S. Census that he was a widower. 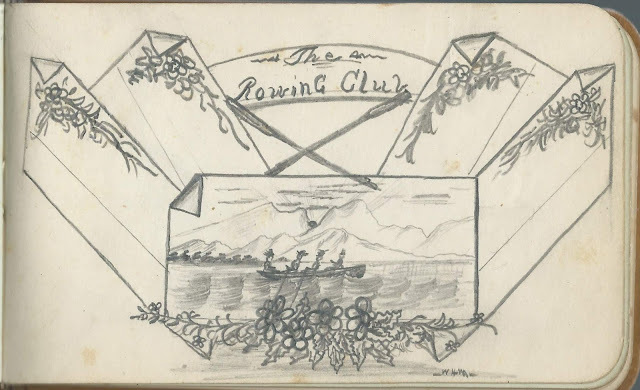 Someone with the initials W. H. W. or W. H. M. sketched a scene of the Rowing Club in action. Adna's teacher Rena A. Eaton inscribed a page in 1883. If you have corrections to the information above and/or information on any of the people listed below, please leave a comment or contact me directly. 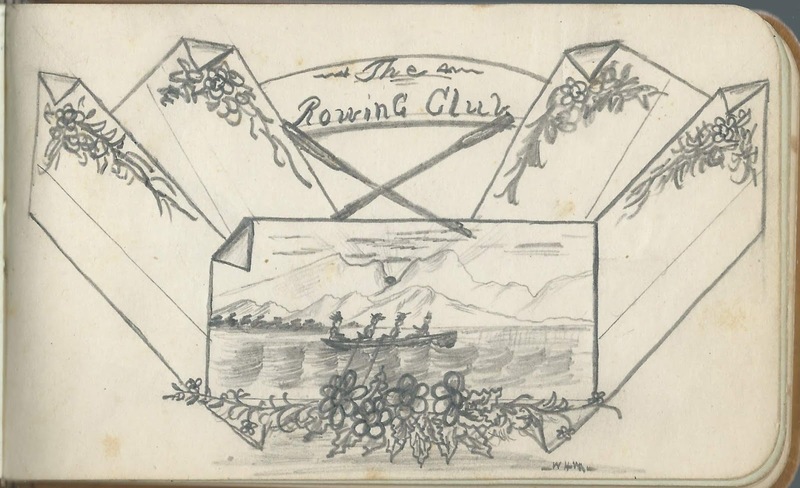 Sketch of four rowers, "The Rowing Club", by W. H. M. or W. H. W.
William H. Brown of Vinalhaven, Maine; inscribed on September 27, 1890. His handwriting is that of an elderly, ill or visually impaired person. Presumably the William H. Brown who served in the Civil War. 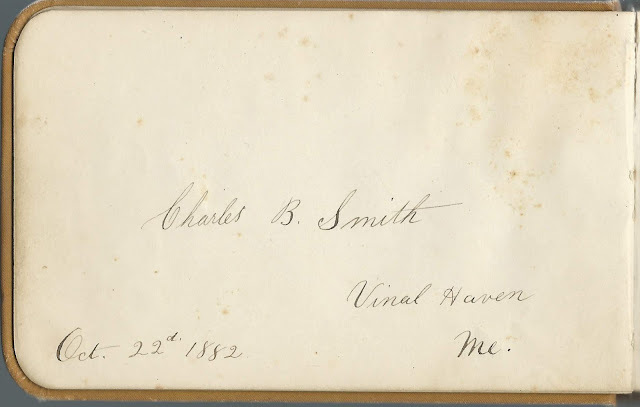 Hattie L. Calderwood of Vinalhaven, Maine; middle initial might be S rather than L.
Emma F. Roberts of VInalhaven, Maine; inscribed on October 23, 1882. 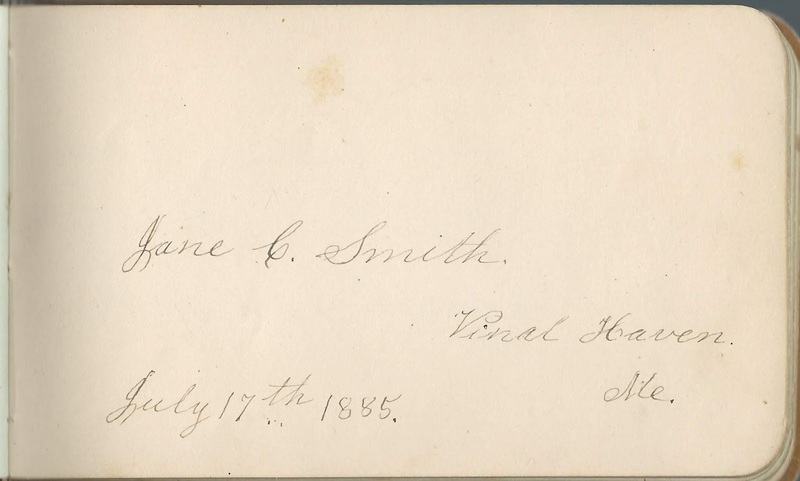 Jennie F. Smith of Vinalhaven, Maine; inscribed on November 16, 1885. Mrs. C. E. Stevens of Lewiston, Maine; inscribed on October 22, 1886; her husband C. E. Stevens inscribed the right facing page. Julia A. 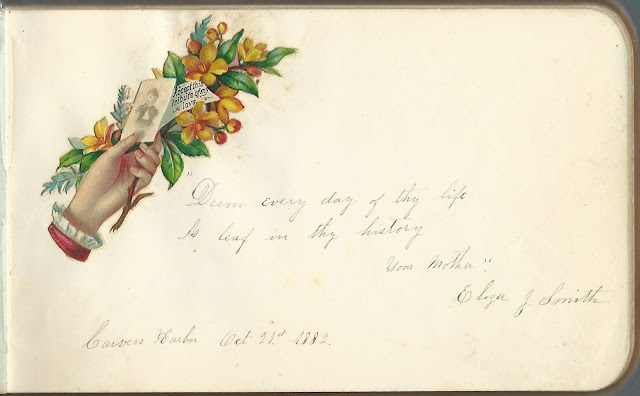 Treat of Belfast, Maine; inscribed on October 13, 1887; presumably Julia Ann (Sanborn) Treat, wife of Upham Stowers Treat, who also inscribed a page. 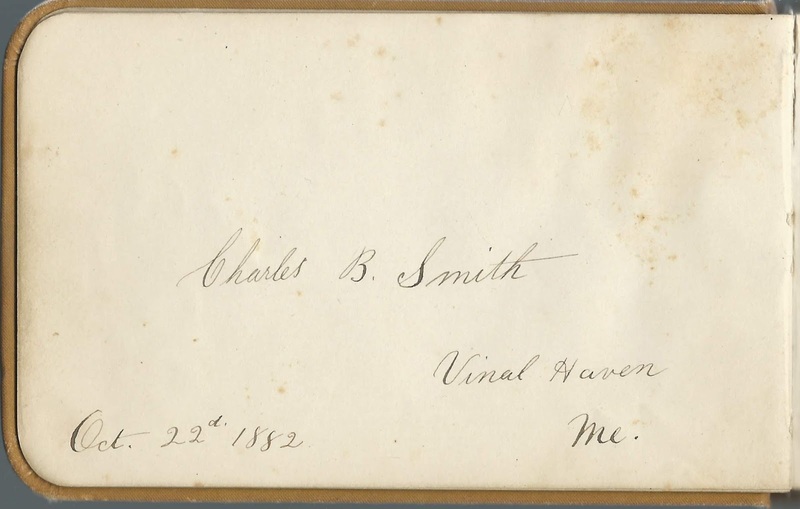 Upham S. Treat of Belfast, Maine; inscribed on October 16, 1887. Upham Stowers Treat, whose wife Julia A. (Sanborn) Treat also inscribed a page.